As with most things in life there are right & wrong, proper & improper, acceptable & unacceptable ways to inject anabolic androgenic steroids (AAS). Sound injection protocol (the correct steps to follow) exists to protect the steroid user from harm. Following said protocol, along with proper handling procedures, can prevent a variety of minor and major negative effects that can occur during AAS usage. Unfortunately many users are either unaware of, do not understand, or simply don’t care about the importance of practicing the appropriate injection procedures. As a result, they routinely disregard even the simplest principles, from basic hygiene to determinations of where and how to inject these hormones. This section will discuss injection methodology along with the very important ‘WHY THEY SHOULD BE USED’ reasoning, and includes: selecting the proper equipment; rules for practicing safe hygiene; choosing the correct injection sites & specific spots on the body and; the step-by-step principles that should be followed in the practice of safe AAS injection. The following is a small informational component of a larger educational website designed to raise awareness. More specifically, it is NOT intended to help readers learn how to inject AAS, but rather to equip them with the truth about the WHATs, HOWs & WHYs behind the injecting of anabolic steroids. Choosing the proper needle (the very thin pin that is stuck into the body) and syringe (the chamber that holds the fluid for injection) is an important AAS usage component, but first it’s necessary to learn a little about them. The gauge represents the diameter or size of a needle, a.k.a. pin. The larger the gauge number, the thinner the pin. For example, a 25 gauge needle is a whole lot thinner than a 20 gauge needle. The types of needles chosen by steroid users vary in size based on the users’: steroid type (oil and/or water-based) substances; amount injected (it takes longer to inject with a thinner pin); size of the muscle group being injected (typically larger groups have less residual pain) and; very individualized preferences for all of the above. AAS users typically choose sizes they can apply to both water and oil-based injectable steroids, thus generally speaking, the most common sizes for AAS use are 22 & 23 gauge needles. These needles also come in a variety of lengths which are selected based on how deeply they must penetrate in order to reach the muscle for injection. For example, a small 1’’ needle (and if appropriate even smaller) is often used to inject into the smaller muscle groups like the deltoids/shoulders or pectorals/chest muscles that are covered by very little fatty tissue, whereas longer 1.5 - 2‘’needles are reserved for the buttocks and other deeper muscle regions. Syringes also come in a diversity of sizes, or capacities (the amount of fluid they hold) which are measured in milliliters abbreviated ‘ml’ or cubic centimeters abbreviated ‘cc’, both of which are equal in measurement . Typical AAS usage ranges from 1 - 3ml, based on how much the user intends to inject at one time. Needles and syringes can be purchased together as unit, or separately for later assembly. Hygiene is a very important issue when it comes to injecting anything into the body. As mentioned earlier, the average recreational steroid user often overlooks or simply neglects this component. Nevertheless, much of the world is comprised of open and closed systems. A house during a birthday party, where visitors are constantly going in and out, is an example of an open system into which insects, dirt, pests, germs and other undesirables have access. After the party, when the doors and widows are closed and locked, it becomes a closed system that only the family can access. Other systems like the brake line on a car are more permanently closed in order to resist contaminants such as air, dust and dirt. Similarly, the body is made up of both open systems accessed by upper (on the head), and lower (for elimination) openings that make it (much like the house during a party) susceptible to infection from germs, bacteria and viruses. However, the body also contains closed systems among which is the circulatory system. Just as the brake line on a car can be opened for repair, so the circulatory system can be injected with medicinal repairs like immunizations, pain-killers, and numerous other medical treatments. Whenever a closed system is accessed there is the potential for contamination. In the case of injecting AAS, contaminants like germs, dirt and debris can easily be introduced at the steroid user’s injection site along with the needle. Because of this threat, some very good principles have been put into place to limit the possibility of infection which can swiftly result in the development of abscesses (large, localized collections of pus-filled infection sites, often surrounded by very painful, swollen and inflamed tissue). Abscesses really hurt, I repeat abscesses hurt…BADLY, and unfortunately they can take a long time to go away. Although abscesses are probably the most visible short-term problem, there are a host of far more dangerous long-term ones that can occur from reusing and sharing needles, not properly preparing the skin for injection, and failing to keep both the skin and equipment sanitary throughout the injection process. Injections of medications that are shot directly into the bloodstream are called intravenous or IV injections. This is often done very deliberately and intentionally. Whether injecting or drawing blood a nurse will usually search for the best vein, and then (so as not to pass through the vein) inject sideways into it. This is NOT the procedure used for AAS! AAS users NEVER inject intravenously as this can have very immediate negative and possibly fatal (resulting in death) consequences. Injectable s teroids are ONLY intended for intramuscular, also called IM injections! This means that the needle has to go through the skin as well as the fat and tissue layers beneath it, then on into the muscle itself. For an illustration of this, see the pictures beneath ‘Injection Protocol’ #9 below. 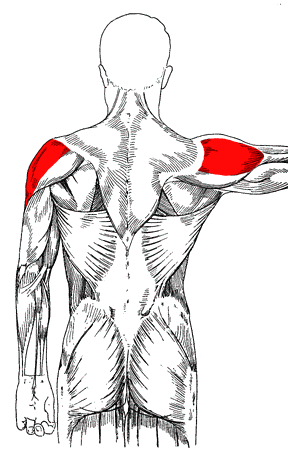 Pictured in order here are several of the steroid user’s injected muscle groups. 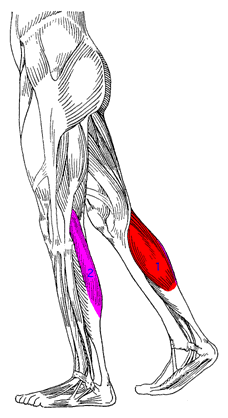 Favorites among these groups include the Buttocks, the outer Quadriceps/Thighs, and the lateral (top outside) surface of the Hips (SEE: the section entitled ‘Best Injection Spots’ for an illustration of this one). 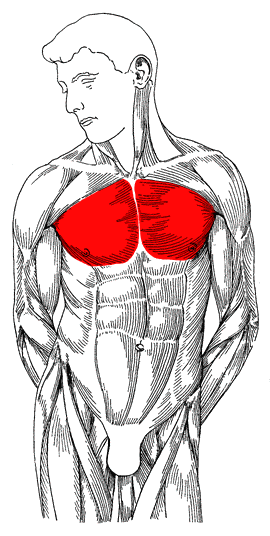 AAS users single out these locations because they are densely muscled; containing numerous muscle fibers and vast amounts of connective tissue (those that cover, connect and separate the bones from one another and their adjacent muscles). These areas provide excellent conditions for fast AAS diffusion (spreading and absorption). However, very specific ‘spots’ within even these choice muscle groups must be located in order for users to avoid injecting into large groups of nerves and blood vessels. As a rule, inexperienced steroid users do not inject more than 2cc’s of any AAS substance (or combination of substances) at one time, and are careful not to inject the same spot more than once a week, i.e. one shot, per spot, per week. Changing the injected muscle groups, or at least switching to the corresponding group on the other side of the body with every shot, is a practice known as ‘Spot Rotation’. By observing the 2cc limit the user prevents discomfort while the substance is being absorbed, whereas rotating spots permits them to resist the building of hardened callous-like tissue beneath the injection site, b.k.a. scar tissue. Most AAS users consider the upper-outer quarter of the buttock, also know as the Dorsogluteal site (illustrated by the shading below), to be one of the best areas for steroid injections. Another common site for injection is the Ventrogluteal area of the Gluteus/Buttock region. This injection site is located between the index and middle fingers, and is slightly higher and to the outside of the Dorsogluteal site. These are spots are deemed optimal choices because: 1) the area is massive; 2) they have relatively few nerve endings; 3) the chance of the substance entering a blood vessel is very low here and; 4) by injecting here one lowers the probability of touching the sciatic nerve – a very large nerve network that passes through the lower & median buttock areas, and on into the lower body. The ‘Two-Pin’ technique increases sanitation for multiple dose vial users. They draw with the first pin, and then shoot/inject into the body with a new one. This procedure prevents any residual contaminants that may have remained on the drawing pin from being transferred into the body via the injection site. It also makes injection less painful since the drawing needle is necessarily dulled during passage through the rubber stopper atop the vial. A dulled needle increases injection pain because it doesn’t pierce the body as cleanly as an unused one. The protocol below is followed by AAS users who draw from multiple dose vials, but steps 4 - 8 are routinely disregarded by those users who draw from ampoules (also called ampules) and sachets. A shower is STRONGLY recommended. If one is not taken, then wash hands thoroughly with soap and warm water. Thoroughly cleanse (with soap), rinse (with clean warm water), and dry the intended injection area. Sanitize the intended injection area with an alcohol swab. If using a multiple dose vial, be sure to clean the rubber stopper with alcohol. Fill the syringe with an equal amount of air in comparison to the intended dose. Then inject the air into the vial (this practice helps keep a balance of internal/external pressure which makes future withdrawals easier). Holding the vial upside down as depicted in the picture, draw solution into the syringe. Continuing to hold the syringe pointing upwards, replace the needle cover and carefully unscrew the needle. Leaving the protective cover on the new/sterile needle, screw it into place. Relax the injection site, and if possible, stretch the skin taught (tightly) with the thumb and forefinger. This action makes the skin tight and provides for an easier injection. Once the skin is stretched, while holding the needle like a dart, insert it with one swift motion all the way to the end of the needle. This step varies depending on the size of the needle and the depth required for selected injection site). Nevertheless, make sure the needle is long enough to reach the muscle. Do this at a 90 degree angle relative to the muscle being injected as illustrated below. 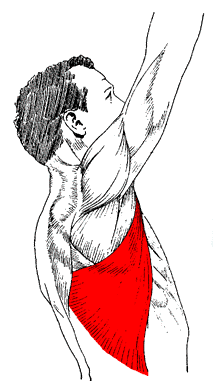 Shooting on a 45 degree angle (also illustrated below) may not permit full passage through the fat and tissue layers and into the muscle fibers. Then aspirate, which means to pull back on the plunger to confirm that blood is NOT entering the syringe. As long as NO blood has entered (signifying that a blood vessel was not hit, and that this is a good injection to continue), proceed by pushing down on the plunger with slow steady pressure. Once the syringe is empty, pull the needle out with one swift motion, and put pressure on the area with a sterile alcohol pad while massaging in a circular motion. Apply a bandage, recap the needle, and dispose of everything in a safe manner to prevent later injury to yourself or others. BEHRE, H.M., K. ABSHAGEN, M. OETTEL, D. HUBLER AND E. NIESCHLAG. Intramuscular injection of testosterone undecanoate for the treatment of male hypogonadism: phase I studies. Eur J Endocrinol 140:414 – 419. 1999. EVANS, N.A. Current concepts in anabolic-androgenic steroids. Am J Sports Med 32:534 – 542. 2004. HAUPT, H.A. AND G.D. ROVERE. Anabolic steroids: a review of the literature. Am J Sports Med 12:469 – 484. 1984. PORCERELLI, J.H. AND B.A. SANDLER. Anabolic-androgenic steroid abuse and psychopathology. Psychiatr Clin North Am 21:829 – 833. 1998. R. SHEN AND S. BHASIN. Testosterone-induced increase in muscle size in healthy young men is associated with muscle fiber hypertrophy. WILSON, J.D. Androgen abuse by athletes. Endocr Rev 9:181 – 199. 1988.